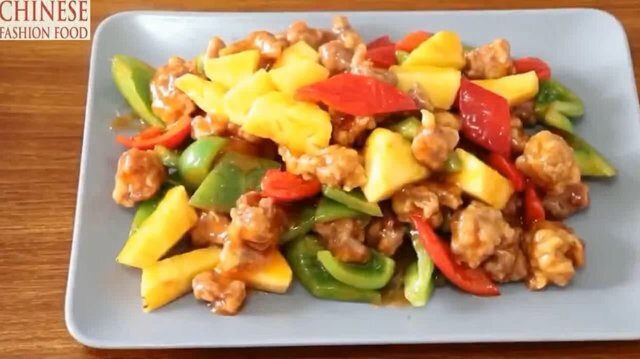 Today I share with you a famous dish in Guangdong, China: Pineapple Fried Pork. 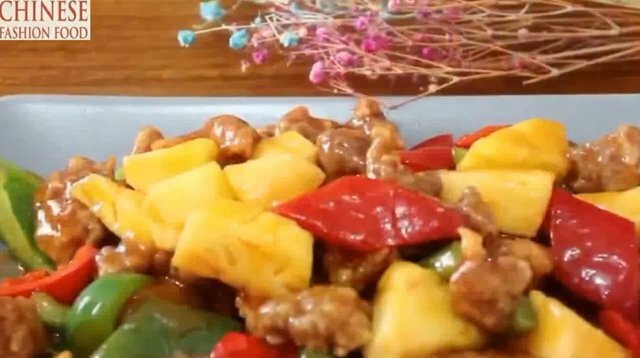 Pineapple fried pork is a famous dish in Guangdong, This dish was created by the Qing Dynasty. Since many foreigners in Guangzhou at that time were very fond of eating Chinese food, they especially liked to eat sweet and sour pork ribs, but they were not used to eating bones when eating, So the Guangdong chef used pork instead of pork ribs to invent the dish. 1: pork (300 g); 2: pineapple (100 g); 3: green tomato pepper (10 g); 4: red tomato pepper (10 g); 5: ketchup (15 g); 7: salt (4 g); 8: white sugar (30 g); 9: white vinegar (2 ml); 10: soy sauce (3 g); 11: cooking wine (3 ml) 12: potato starch (14 g); 13: vegetable oil (100 ml); : Eggs (one). 7: Finally, add the fried pork and pineapple and stir fry for 2 minutes. 3: The taste of this dish is sour and sweet, you can add the seasoning according to your favorite, the list is for reference only. Tomorrow I will share with you the travel of China Yuntai Mountain (AAAA), Yuntai Mountain is also my hometown, It's scenery is really very beautiful. This is a beautiful dish with lots of color & easy on the calories. Really liked this, partially due to the texture of the particular meat I used, but the taste of the dish was really intense, and the cayenne pepper added a perfect amount of heat to it. Dear @tute5, my bandwidth energy is too small, many times I reply to you but I have not succeeded. I know that you are very kind, you will forgive me.